Hundreds of people have been mobilised to find the young football team and their coach who have been trapped in a cave since Saturday. Hundreds of people have been mobilised to find the young football team and their coach who went into the cave on Saturday and were trapped when heavy rains are believed to have flooded the cave’s main entrance. Anxious relatives camped out at the cave near the border with Myanmar and Laos praying for the children’s safe return. “My child, I’m here to get you now,” one crying parent said, according to footage from local media. Another wailing mother screamed: “Come home my child!”. The children, aged between 11 and 16, are believed to have retreated further into the cave as monsoon rains fell and flooded the cave, believed to be several kilometres (miles) long. Park officials, police and soldiers were dispatched on foot, while an aerial team was also being prepped to scour the scene, according to an AFP photographer at the scene. “Our team in the area went inside the cave early morning and will continue to walk to the cave’s end,” Thai Navy SEAL said on its Facebook page. Information coming out of the area was spotty with cellphone signals blocked inside the cave, and the Navy urged patience from the public as it searched for the children and their coach. 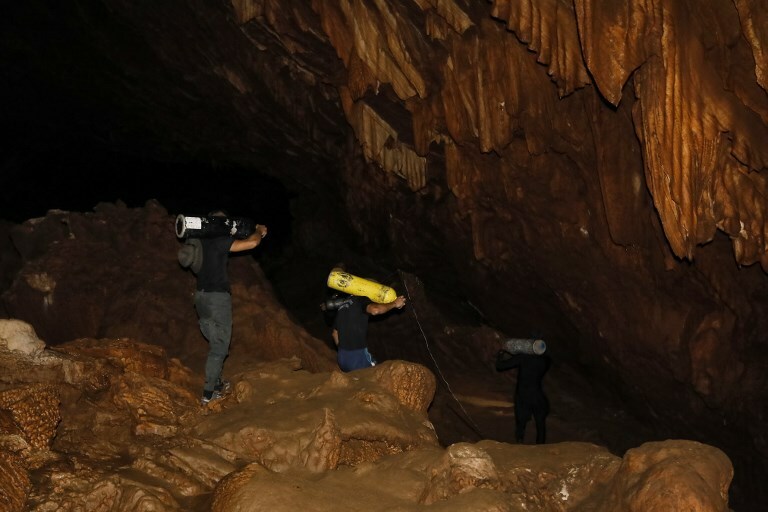 An underwater robot is set to be dispatched later Tuesday to help survey the Tham Luang cave, a popular site among local tourists. “We will bring the underwater robot to help survey the area to know how big and how deep the cave is to help the diver,” said Sawangtit Srikitsuwan, an aerospace and marine engineer at Bangkok’s King Mongkut’s University of Technology. 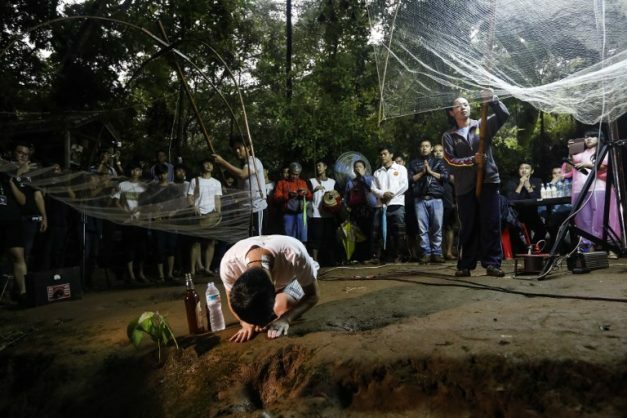 Rescuers found bicycles and a motorbike at the entrance of the cave Monday, and divers said they spotted footprints in one of the cave’s chambers. Heavy rains are common in the area during Thailand’s monsoon season from May to October, with flooding and landslides routinely reported.